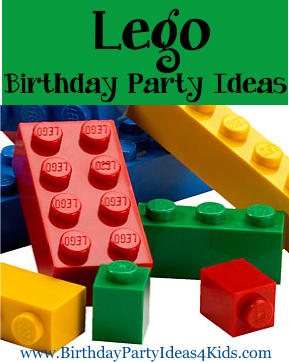 Lego theme birthday party ideas for kids! We've collected all of our favorite Lego themed party games, activities, ice breakers and great ideas for party food, favors, decorations and more and placed them all on one page. Mix and match your favorite Lego party ideas to make the perfect party! This is a great ice breaker game to play at the beginning of the party while guests are arriving. Fill a glass or clear plastic jar with lots of Lego pieces. As guests are arriving ask them to guess how many Lego's they think are in the jar. Write down their name and their guess on a piece of paper. The guest who guesses the number closest to the actual number of Lego's in the jar wins! You can present them with the jar of Lego's as the prize or give them small toy or treat. Before the party count the Lego pieces while you are putting them in the jar, write down the number and keep it in a safe place. Before the party purchase Lego stickers - enough that each guest will have at least 8 - 10 for themselves. When guests are arriving for the birthday party give them a sheet of stickers. The object of the game is to get rid of all their stickers by placing them on other party guests without the guest knowing or getting caught. If they are caught placing a sticker then they have to take all the stickers off the party guest who caught them and try and place them on other kids. Only one sticker at a time. The first guest that gets rid of all their stickers wins! This is a fun relay game and a one of our favorite Lego party ideas that can be played indoors or outside. The object is to be the first team to fill their bucket with Legos' relay style. Set up the game by placing two buckets filled with Lego's at the starting line (one for each team) and two empty buckets at the opposite end of the playing field. Divide party guests into two teams and have them line up behind the first person on their team. Give each team a large spoon and one at a time 1 person from each team scoops up Legos from their bucket and walks/runs to their empty bucket and drops the Legos inside. Then they run back and hand the spoon to the next person in line. The first team to fill their bucket wins! If Lego's are dropped along the way the player must pick up the dropped Lego's and go back to the start of their teams line and try again. Divide the party guests into two or more teams and give them each a bucket or box with the same amount of Legos. The teams must build a tower as high as they can without it falling over in the set amount of time. Set a time limit - 5, 10 or 20 minutes - and have teams try to build the highest tower. Towers must stand by themselves with no help from the kids. Players must use Lego’s to make a path from one side of the playing field to the other. Measure out a distance between the start and ending point and make sure it is the same distance for each team. Mark the spot with sidewalk chalk or an orange cone so players know where to go. Divide birthday guests into teams and one at a time relay style they must connect Legos from the start to the end point. The Lego's have to connect. Just like the egg and spoon race but instead of racing with an egg a Lego is substituted. Divide into teams and give each team a spoon and a Lego piece. On go, one at a time, they must hold the Lego on the spoon and run down the playing field, around an orange cone or marker and then back to their team. They then hand off the spoon and the Lego to the next person on their team. The winning team is the one who has all of their players back behind the starting line first. To make it more challenging have the teams add a Lego to the spoon each round. This is a great team game for older children. Set up two tables that are about 5 feet apart. Teams must try and build a bridge from one table to the other table across the 5 foot space. After each team has built their bridge test them with weights to see which one is the strongest. Players use only chopsticks to move Lego pieces from one bowl to another bowl as fast as they can. Give each guest a pair of chopsticks and place the same number and size Legos' in a paper bowl. Give them another paper bowl to transfer the Lego's into. For older kids and for more of a challenge have them play this game blindfolded or make it a team game by having two players work together, each one having one chopstick, to move the Legos. The object of this fun game is to transfer a pile of Legos from the start to the end point using paper towel tubes. Divide the players into teams and have them stand in a line from the start to the ending point. Give each player a paper towel tube and one at a time they must put a Lego into their tube, and then pass it to the player next to them using only the tubes. The Lego's continue down the line of kids with paper towel tubes until they are deposited in the end point container. Set a time limit and at the end count how many Lego's each team was able to get down the line. The players don't have to wait until the first Lego is down to the end point ... it's continuous. For a bigger challenge or for a second round use large wrapping paper tubes or pieces of PVC pipe. Scavenger Hunt – Before the party hide large Legos around the party area or backyard. Use mostly one color of Lego. Add in a few other colors and give them a point value or assign a prize to match the colored Legos’ color. When the players return they can trade their Lego’s for prizes or candy. The colored Legos' get a bigger prize. Lego brownies – cut brownies into rectangles. Ice them with red, yellow, blue and green frosting and then put the same colored M&M candies on top to look like Legos. Marshmallow heads – Wet large marshmallows with a little bit of water and then roll them in yellow colored sugar. Place on sticks and draw on eyes and a smiling mouth with cookie frosting. Or place them on top of cupcakes when finished. Make large legos props from boxes. Cut into rectangles, paint and then glue on circles that are painted the same color. Choose 3 or 4 colors from the Lego’s and use them as your palette. Solid color plastic table cloths on rectangle tables will look like a Lego if you place the same color paper plates on it at everyone's place. Solid color balloons and streamers are always festive and add a great touch to the party. If you are really creative you can make place cards by spelling out guests names in Lego’s and placing it in front of where they will sit at the table. This can also double as a party favor! Make a banner out of cardstock cut into rectangles and then hot glue the back to ribbon or twine. Spell out your child’s name or “Happy Birthday” in Legos and place on the mantle. Hint – this looks better when each letter is done in the same color Legos. Make a utensil holder for forks and spoons out of Lego’s for the food table. Wrap empty rectangular boxes in solid color wrapping paper and then add the same color circles so they look like Lego’s. Place them on the mantle, on tables and use as a centerpiece. Large party decorations for walls can be made using a piece of colored poster board and gluing on the same color paper plates to the poster board. Hang around the party area or place on the mantle. This makes a great background for pictures. Buy solid color paper bags and glue circles to the outside in the same color so that it looks like a large Lego. One solid yellow bags draw two eyes and a smile with a black permanent marker on the outside to look like a Lego character. One solid yellow bags draw two eyes and a smile with a black permanent marker on the outside to look like a Lego character. Wrap small rectangular boxes with solid color wrapping paper. Wrap the lid separately - place treats inside and them put the top on the box. Glue circles on the top of the lid so that it looks like a big Lego.